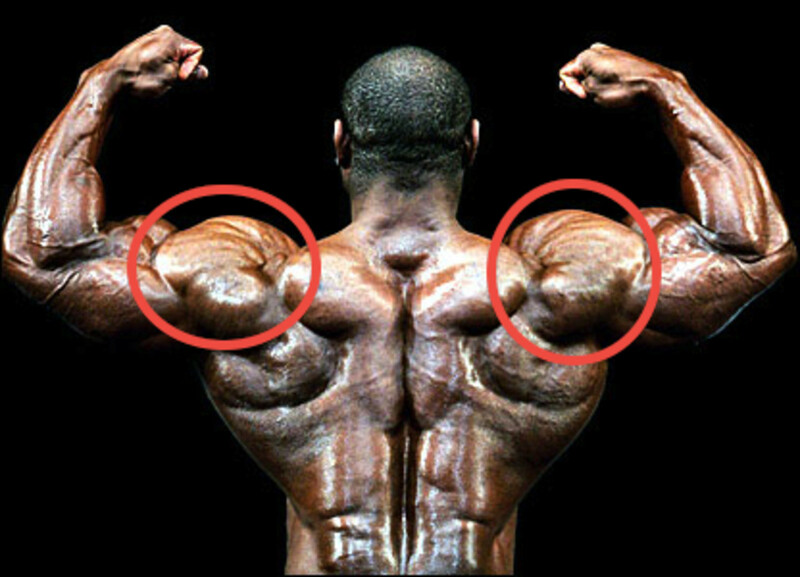 Building big, strong shoulders muscles seems pretty straightforward. I mean, press something up in the air and you activate the shoulder muscles, what’s the big mystery? While shoulder presses are a key to deltoid development, there are three muscles to exercise in this muscle group, the anterior, medial and posterior deltoids, and a single movement won’t develop all three to their full potential. It has a compound movement in it, essential for maximum muscle gains. 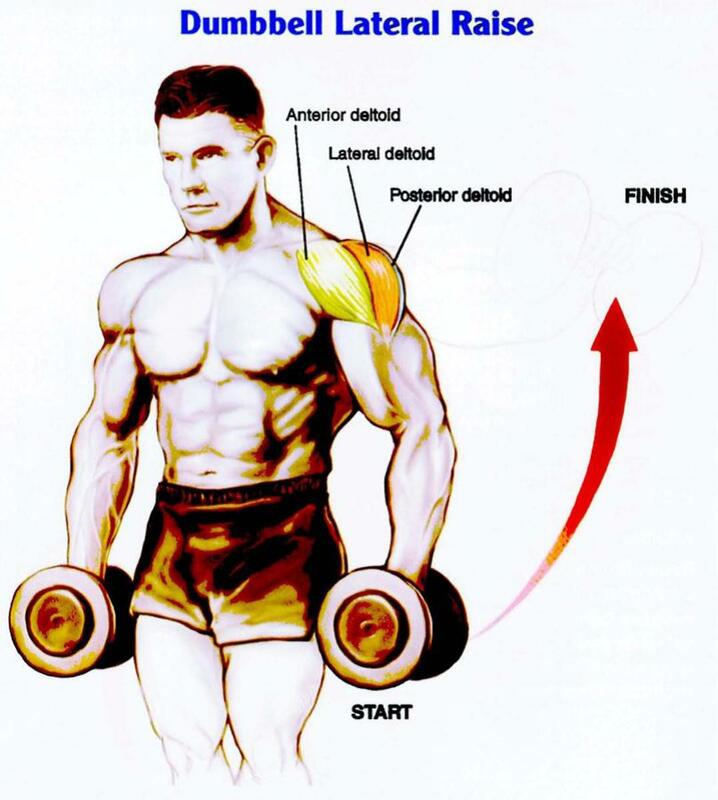 It exercises all three parts of the deltoid in isolation, which helps develop those ‘cannonball’ deltoids. The exercises can be modified to reduce strain on the lower back if it is an issue. 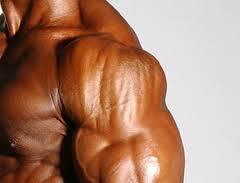 To work the shoulder muscles, you need a strict range of motion. These are not the largest muscles in the body, but an injury due to bad form or excessive weight can carry over into every area of your life. But don’t worry! You still get to lift big! It just has to be done with discipline. A great book for the maintenance of this important area of the body. Learn how to prevent rotator cuff injuries using over 100 exercises. A great value at this price. Before starting your shoulder exercises, warm up the area thoroughly to avoid injury. When performing the movements, focus on feeling the shoulder muscles work. For the overhead presses, make sure you are not doing a ‘push press’ which uses the legs to help drive the weight overhead. That exercise has its place, but not when you are focusing on developing the deltoids. Do not arch your back when performing the overhead press, it doesn’t matter whether you are doing these standing or seated. If you must arch your back to get the weight up, you are doing an incline press and the weight is probably too heavy. Drop the weight, work the right muscles, and your deltoids will feel more pumped and exhausted as a result! Joint rotations. This is slow, deliberate, easy movement. Rotate neck, shrug shoulders in a circle, do arm rotations, swivel hips, circle knees and ankles. 3-5 rotations on every joint. Next: Your favorite cardio exercise for about 10 minutes (not much more, you need the energy to work your shoulder muscles.) This can be biking, jogging, shadow boxing, even jumping rope. Nice and easy, no intensity. You can also do some easy jumping jacks and burpees or go for a brisk walk. Standing or Seated Military Press: x 6-10 (see below.) If you are tempted to use your legs, do these seated. Keep your abdomen and legs tight to support the movement. 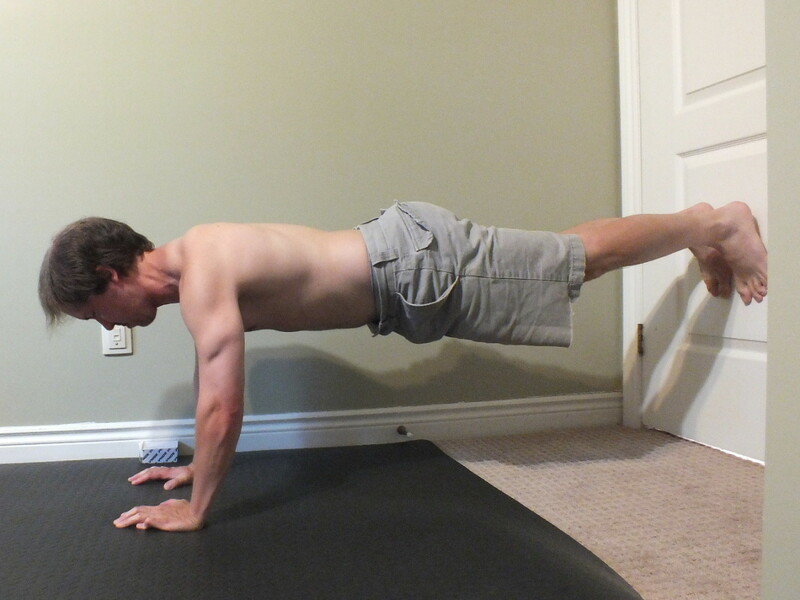 Press up in a straight line and lower the weight in a controlled motion. You get more out of this by pressing it up without jerking. Rest about 60 seconds between sets. If you are having pain in your lower back doing this last dumbbell complex, you can try a couple of things. First, try bending your knees and adjusting your posture to relieve the strain. If you still feel uncomfortable, you can try these seated, but keep your stomach muscles engaged. If back pain is persistent when performing these, you can do them with a suspension trainer. 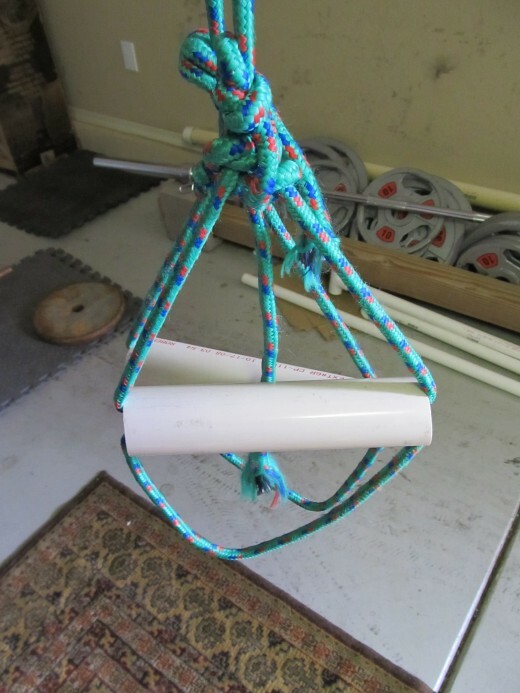 A suspension trainer is cheap and easy to make, and there are many ways to hang it from a door, wall or ceiling. Doing these suspended is still very challenging, but scalable to individual strength levels. The nice part is it completely relieves your lower back from strain. There are two schools of thought here: you can spend $99-$220 dollars on a commercial suspension trainer, which will buy excellent instructional dvd’s, easy adjustment ability and comfortable, cushy handles and foot straps (oh yes, and a door anchor); OR you can pick up some rope and pvc pipe and tie some knots. 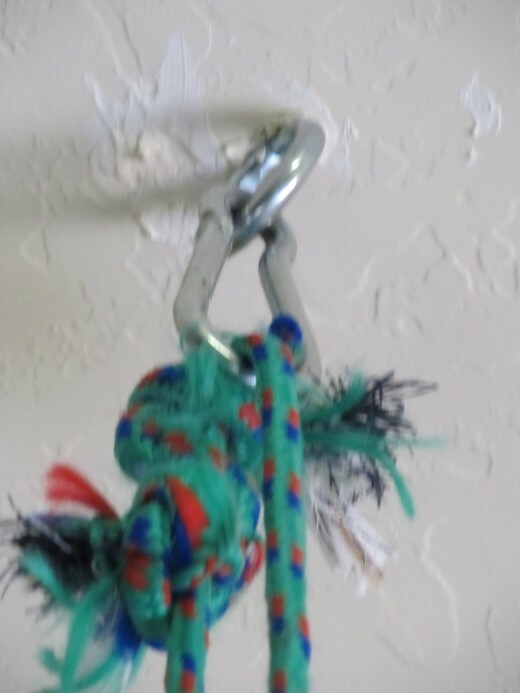 This second only requires a strong eye hook, which doesn’t even have to be closed, and a carabiner if you like. Find the joist in the ceiling or a stud in the wall, and it should be possible to screw directly into the wall with little more than some hand strength and a pair of pliers to turn the hook. The exercises you would do are called ‘TYW’. 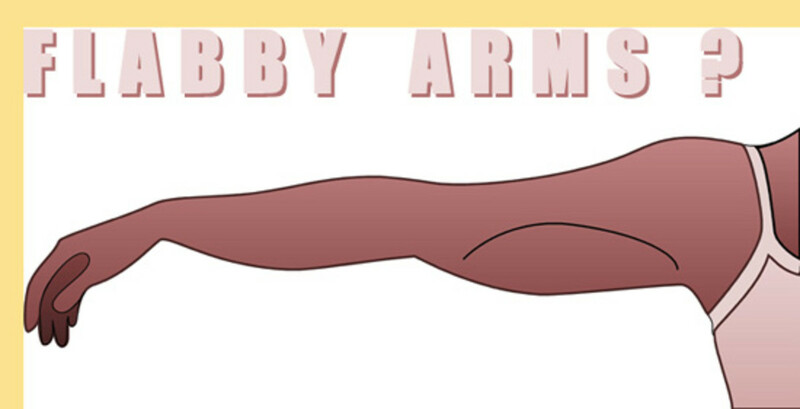 These correspond with the letters made with your arms when doing the exercises. For the 'W', your elbows are bent at about 45 degrees with the palms facing forward at the the top of the movement. Beginner: 2x6-8 each/Intermediate: 3 x8-10 eachAdvanced: 4 x 10 each. Now you’re done, and don’t your shoulders feel like a couple of inflatables are attached to them?!? Good work! Remember, if you have done a thorough workout, you can expect DOMS (delayed onset muscle soreness) the day after tomorrow (and sometimes the next day,) so don’t plan on doing this workout again for a few days. Need another great movement to really engage that shoulder muscle? 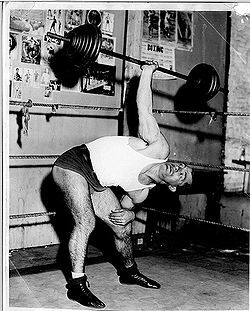 Look no further than the old strongman classic, the bent press. This exercise will challenge the deltoids and other muscle groups, but it must be performed in strict, correct form to avoid shoulder pain and injury. Because the correct execution of the bent press requires engaging the lats and the entire core for stability, we can safely call this a compound movement. Start by cleaning a kettlebell (or water jug or dumbbell) to the shoulder. Use light weight until you are comfortable doing the exercise. Turn the feet at an angle away from the working arm at about 45 degrees. As you bend underneath the weight (see the picture) simultaneously straighten the arm. At the bottom of the movement, keep the arm straight and 'push' the weight overhead by engaging the core, the active arm and pushing into the ground with your legs until you are standing straight with the weight overhead. Repeat. The key is to use a slow, deliberate movement.